Check out the A La Carte menu to fully customize a perfect meal that everyone will love! Feeling overwhelmed? Check out our *NEW* Party Packages. Decide pick-up or delivery. Do you require set-up? Our A La Carte menu is now available to order online. For Party Packages visit or call your nearest Q-BBQ. Step 5: Sit Back and Relax... we got this! 70 S. La Grange Rd. A La Carte Menu for catering will be available via online ordering mid January 14, 2019. Check back for updates. 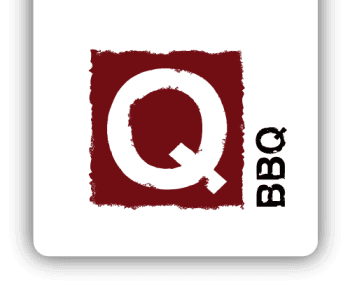 Please call your Q-BBQ location to order from the catering menu or fill out an inquiry form, listed above. PARTY PACKAGE MENU - PLANNING IN A HURRY? Packages #1 & #2 include Smoked Meats, Sides, Brioche Slider Buns, Q-BBQ Signature Sauce, Hush Puppies, Pickles, Serving Utensils, Plates, Napkins and Flatware, and Warming Kit. Ribs and Wings excluded. See A La Carte menu to add to your order. Available for parties of 15 or more. A hearty spread of Q-BBQ's must-have items will have your guests saying, "Holy Smoke!" Includes 1 - 2 Smoked Meats (1 Premium), plus Ribs, Wings, 2 Regular Sides, Salad, Brioche Buns, Pickles, Serving Utensils, Plates, Napkins and Flatware. Includes 1 Smoked Meat Sandwich w/ Signature Sauce, 1 Regular Side, 2 hush puppies, pickles, a cookie & Flatware. Our meats are smoked low and slow. This results in a pink color. This is the smoke ring which we like to call the Ring of Fire. Rest assured - our meat is always thoroughly cooked. Smoked up to 12 hrs. Whole hand-pulled chicken, smoked up to 7 hrs. Smoked up to 1 hr. Memphis or Spicy, smoked up to 3 hrs. Chopped or Sliced, hickory smoked up to 22 hrs. A true BBQ delicacy. Smoked up to 24 hrs. All white meat, smoked up to 4 hrs. Our award-winning ribs smoked up to 6 hrs.